Ten world-class soloists put costly Stradivarius violins and new, cheaper ones to a blind scientific test. The results may seem off-key to musicians and collectors, but the new instruments won handily. 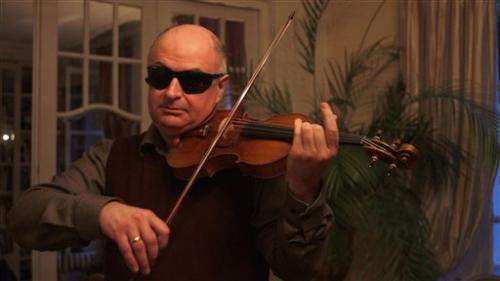 When the lights were dimmed and the musicians donned dark glasses, the soloists' top choice out of a dozen old and new violins tested was by far a new one. So was the second choice, according to a study published Monday in the Proceedings of the National Academy of Sciences. Of the six old violins tested, five were by made by the famous Stradivari family in the 17th and 18th centuries. The newer violins were about 100 times cheaper, said study co-author Joseph Curtin, a Michigan violin maker. But the Strads and other older Italian violins have long been considered superior, even almost magical. The idea was to unlock "the secrets of Stradivari," the study said. So the study tries to quantify something that is inherently subjective and personal, the quality of an instrument, said Curtin and lead author Claudia Fritz of Pierre and Marie Curie University in France. A few years earlier, the duo tested violins blind in an Indianapolis hotel room, but this one was more controlled and comprehensive, putting the instruments through their paces in a rehearsal room and concert hall just outside Paris. They even played with an orchestra, the results of which will be part of a future study. "I was surprised that my top choice was new," said American violinist Giora Schmidt. "Studying music and violin in particular, it's almost ingrained in you thinking that the most successful violinists on the concert stage have always played old Italian instruments." French soloist Solenne Paidassi said "there's a paranoia about new instruments," compared to "a glamour about old instruments." Even Curtin who makes new violins for a living, said he was surprised, adding the study was designed to eliminate bias in favor of either group of violins. "I remember trying the old violins and the new violins among ourselves just before the testing got going and saying, 'You know maybe the old ones will win'," Curtin said. But when the lights were turned down, all that could be judged was the sound. Some violins were 300 years old. Some were days old. And when the soloists were asked to guess whether the violins they were playing were old or new, the soloists got it wrong 33 times and right 31 times. Canadian soloist Susanne Hou has been playing a rare $6 million 269-year-old Guarneri del Gesu violin and knows what she likes and what she doesn't. During the testing, some of the violins she played for only a few and then held the instrument out at arm's length in noticeable distaste. But, like others, she was drawn to a certain unidentified violin. It was new. "Whatever this is I would like to buy it," she said in video shot during the September 2012 experiment. Schmidt, who normally plays a new violin with a little more down-to-Earth price tag of $30,000, liked a different new one, calling it extraordinary in a phone interview: "I said kiddingly to them I will write you a check for this fiddle right now." Curtin said the researchers won't ever reveal which instruments were used to prevent conflict of interests or appear like a marketing campaign. James Woodhouse, a professor of engineering and expert on musical instruments at the University of Cambridge in England, wasn't part of the study, but praised it as solid "and very tricky to carry out." Classic violins "are still very good, but that when a level playing field is provided for making honest comparisons, the very best of the contemporary instruments stand up remarkably well in their company," Woodhouse wrote in an email. Hou, whose four-year loan of the classic Italian violin has expired, explained in an interview that finding the right instrument is so personal: "There are certain things you can't explain when you fall in love." And since Hou is shopping for violins this week, one of the restrictions on the experiment truly bothers her: The scientists wouldn't tell her who made the violin she fell for. most people , including musticians , have no conception or experience beyond the name . those who've heard one have as likely been as influenced by the demonstrator as the instrument , and given their value they don't tend toward be in the hands of mediocre players . those that have played one , may have played a good one or a dog , but most likely the reputation was earned for cause . in 200 years , violin makers have improved their craft ... and you notice , both musicians wanted to buy the same violin , on the spot . The source of subjectivity are physical parameters. Yes, the physics of nature are inherent to nature. Yes, physics is measurement. The postulate reigning presently over all measurement is labeled (described as) indeterminate. Beauty is in the ear of the beholder. And physics postulates there is chance that more than one will agree to the beauty heard. I think that there is something akin to a "placebo effect" for musicians when they play an old Stradivarius. They think they have the best available violin, which improves their confidence and self-esteem so that they actually perform at superior levels.